How can I Improve Warehouse Efficiency with Cogan Mezzanines? 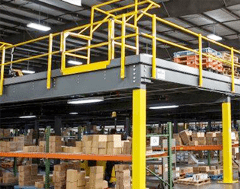 | S. W. Betz Company, Inc.
How can I Improve Warehouse Efficiency with Cogan Mezzanines? One of today’s concerns with warehouse facilities is the ability to operate in an efficient, ‘greener’ manner. It’s incredibly important to have a sustainable workplace for both the facility and for the environment. Cogan mezzanines play a huge part in efforts to improve warehouse efficiency. S.W. Betz can help you operate a greener facility through our warehouse equipment solutions. When you think you’ve run out of space in your facility, ask us first—we have various solutions, such as Cogan mezzanines, to put your available facility space to maximum use. Renovations or moving to a new facility can be costly, time-consuming, and above all, unnecessary. Many facilities who feel they must renovate or relocate to address space issues are not making use of the vertical storage space in their facilities. That’s where mezzanines come in. Cogan manufactures mezzanines to meet your business needs, whether it’s just a little bit of extra space or a generous amount needed. These systems are adaptable as well. As your facility grows and changes, they can be modified to adjust to your new facility needs. This is huge for efficiency, as no new system needs to be installed and utilized. S.W. Betz is able to provide all installations, upgrades, and modifications to your Cogan mezzanine system as needed, saving you time and stress. Utilizing existing warehouse space not only benefits your facility, but it is also a part of a more sustainable plan. Cogan equipment is high quality and one of the most trusted names in the business, and when installed by professionals at S.W. Betz, it makes for a system you’ll enjoy years of use from. Founded in 1933, the S. W. Betz Company, Inc. is one of the area’s oldest distributors of quality warehouse equipment. We are an official distributor for some of the top manufacturers in the materials handling industry, including Wesco Manufacturing, Morse Manufacturing, Presto Lifts, Quantum Storage Solutions, Husky Rack & Wire, Jamco, and, of course, Cogan. We have most standard mezzanines, partitions, guardrails and cantilever racks available to order for you. This entry was posted on Tuesday, March 29th, 2016 at 4:00 pm. Both comments and pings are currently closed.